Consuming juicy pears regularly is going to bring you many beauty benefits and make you look pretty, glowing and refreshed. This delicious, anti-aging fruit is rich in antioxidants and dietary fiber, which makes it an amazing natural remedy to treat many beauty related skin problems. If your face is too oily or you have acne-prone skin, pears can be really beneficial for you, because this fruit has ability to boost the immunity system and enables the skin to become strong enough to fight against all kinds of skin infections. Pears are very good natural moisturizer for a flaky and dry skin and a great way to have a soft and smooth skin and hair. Since pears are loaded with antioxidants and have ability to fight against free radicals, they are able to prevent the formation of fine lines near the lip area and eyes. 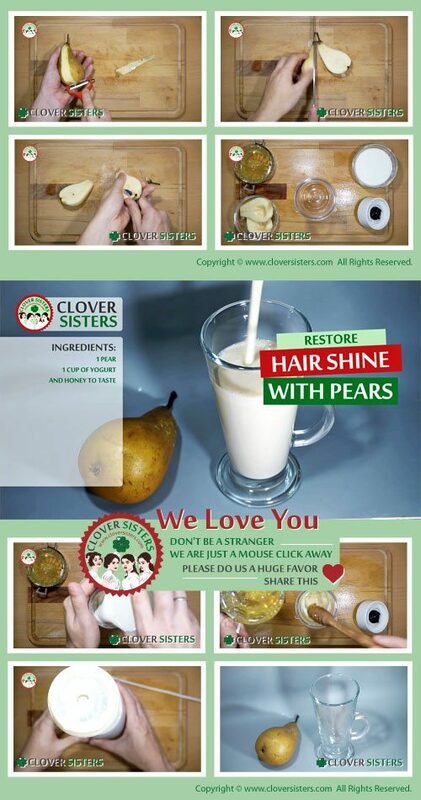 Pears are also beneficial for maintaining the health of the hair, reducing the dryness of the hair, scalp nourishment, dandruff removal and scalp psoriasis. Moisturizer is essential for beautiful skin, however, buying good one can be expensive, so it’s useful to know that pear is a very good natural moisturizer for oily or dry skin. With age, the skin suffers natural wear-and-tear, and the best strategy to keep your skin smooth is to prevent skin damage in the first place. Pears are loaded with dietary fibers, a nutrients responsible for prevention of insulin spikes, and protection of collagen, a protein that keeps our skin smooth. Why paying for expensive and harsh acne treatments if you don’t need to? Due to the high amounts of vitamins and minerals, pears have been shown to treat certain types of acne. Pears boost the immunity system and make your skin stronger from inside, so skin can fight against pimples, acne and other skin infections. Drink this delicious smoothie during pear season. Take 1 pear, 1 cup of yogurt and honey to taste. Blend until gets smooth and drink it daily.